Why use AL-6XN® alloy? Corrosion-resistance, cost-effectiveness, and availability are just a few of the many reasons. AL-6XN alloy is very attractive to many industries, because it is found to be resistant to a broad range of corrosive environments. It also provides high returns on investment. The biggest advantage is that AL‑6XN is readily available and in stock to address the high corrosion resistance requirements. 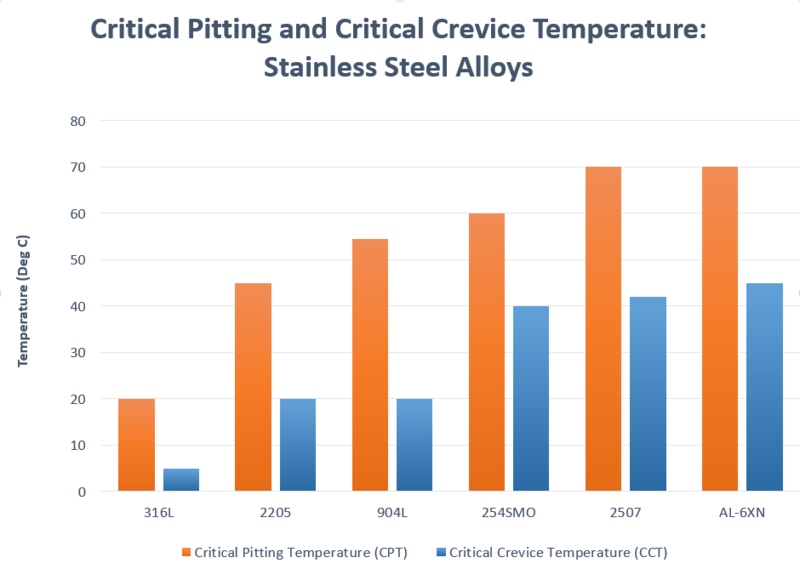 Processes with chloride-induced corrosion in the forms of pitting, crevice, and stress corrosion cracking in 300 series stainless steels are often better managed with AL‑6XN alloy. It is also resistant to corrosion from various acids and salt solutions. Products such as ketchup, tomato paste, vinegar based products, sports drinks, hot water systems, shampoos, toothpaste, and cleaning supplies contain a high percentage of chlorides. Other times, clean-in-place (CIP) chemicals can contribute to corrosion. AL-6XN is an excellent choice in these cases. These values are based on basic raw material testing. Values may change based on the product forms. *Critical Pitting Temperatures (CPT) is the lowest temperature at which pitting corrosion begins in a 24-hour immersion. **Critical Crevice Corrosion Temperatures (CCCT) is the lowest temperature at which crevice corrosion begins in a 100-hour immersion. Corrosion is an expensive problem and can cost billions. Selecting the right materials for process systems is the most efficient and economical means for controlling corrosion and adding life to a piping system. AL-6XN has a high return on investment compared to 300 series stainless steels. Considering factors such as downtime, product loss, and replacements, AL-6XN can provide long-term savings. 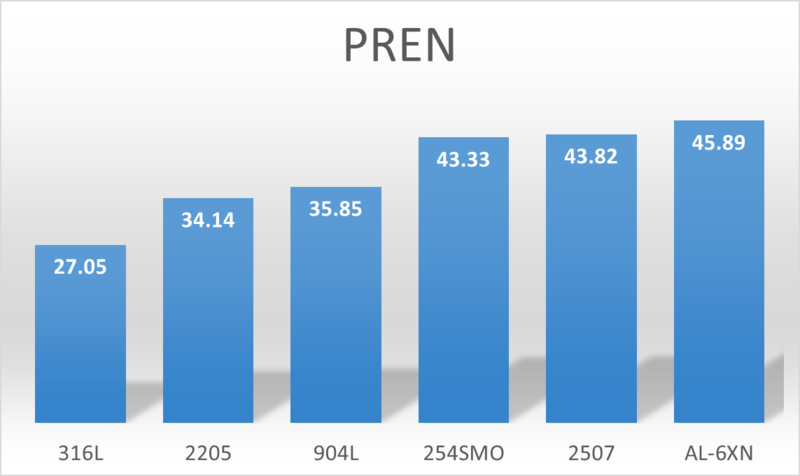 Larger minimum quantity requirements with limitations in product forms can make duplex grades such as 2205, 2507, and the other 6 moly grades such as 254 SMO and 904L more expensive. AL-6XN is significantly less expensive than most of the titanium and nickel based alloys. It is also a cost effective substitute to non-metallic materials such as PVDF, PTFE, TPE, or PVC. These non-metallics could be difficult to install and maintain. AL-6XN alloy has a higher up-front cost than 300 series stainless steels. However, life-cycle costs for systems utilizing AL-6XN alloy can be far less than the comparable costs of the initial installation, maintenance, and subsequent replacement of lesser alloys used in aggressive environments. While quoting a project, it is important to consider the form and type of product. Comparing price per pound of a round bar is not the same as comparing price per foot with a tube. Field welding can be easily achieved when suitable over-matched filler rings are used and the material has been properly cleaned and prepared for welding. Low carbon and high nitrogen content minimizes the precipitation of carbides and secondary phases that can occur during welding. Manufacturers in the personal care industry often use aggressive chemicals in the production of deodorants, shampoos, body washes, toothpastes, detergents, etc. Most of these products use chlorides (salt) as the main ingredient. While these chemicals are good for the end products, they sometimes damage the material that is used for making them. After multiple failures and replacements, a well-known deodorant manufacturer chose to save money and extend the life of their system by replacing their 316L piping with AL-6XN alloy. Learn why this deodorant manufacturer replaced their lines with AL-6XN.